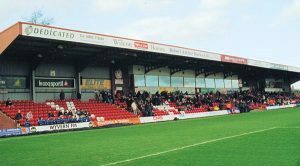 Aggborough, the home of Kidderminster Harriers FC, is a modern stadium situated in a residential part of the town with easy access to all major routes and to the town centre with it’s good complement of shops. The stadium holds 6,238 with 3,140 seats included in that figure. 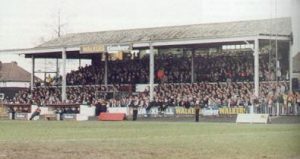 The Reynolds Stand was built in the summer of 1994 to replace an old wooden stand that ultimately cost the club promotion to the Football League earlier that year due to an insufficient seating capacity. 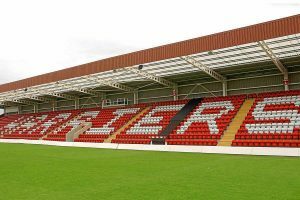 The replacement stand houses the Aggborough Suite and a range of executive boxes, with disabled supporters accommodation at the front of this stand. Also included in this stand are the clubs offices, the club shop and the ticket office. Directly opposite the Reynolds Stand is the new East Stand that was built during the summer of 2003 at a cost of £1.1 million to replace the very popular old stand affectionately called the Cowshed. A smart modern design it houses 2,040 seats for both home and away fans with refreshment bars in the concourse underneath along with large screens showing the news from other games being played that day. At both ends of the ground are identical covered terraces with the North Stand reserved for home fans and the away South Stand for the use of away supporters. Visiting fans also have part of the seating area in the East Stand reserved for their use too. Catering facilities at Aggborough are plentiful, excellent fast food bars that all serve the Aggborough soup that is renowned throughout football. The burgers, hot dogs and cottage pie are also highly thought of. From the South: M5 to jct.6, follow signs to outskirts of Kidderminster (A449). At roundabout by high rise flats take right turn, then at Hoo Rd take left turn up the hill past the flats. Aggborough is about 1 mile on right. M42 to jct.1 (Bromsgrove), go into Bromsgrove and follow the signs for Kidderminster (A448), go straight over first roundabout at Mustow Green, then after 2 miles at next roundabout take left turn,along Spennells Valley Rd. Turn left at third roundabout to go under the viaduct, follow dual carriage way to next roundabout then go all the way round so you turn back the way you came. Turn left at Hoo Rd then 1 mile further is the ground. M6/M5 to jct.3, take A456 to Kidderminster. At traffic lights at Land Oak turn left to next set of lights. Turn right towards town centre, then left at Hoo Rd junction before roundabout. After 1 mile ground is on left. Car parking is in short availability. There is some at the home end of the ground and the charge is £3 per game or £60 for a season ticket. There is a small car park immediately behind the away end, but it is small and there is a fee of £5. Parking in near by residential streets is discouraged by the police. * on production of valid ID. 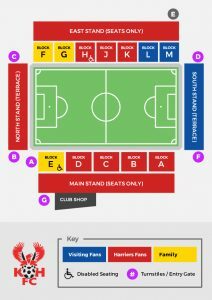 Disabled supporters are charged the concessionary price, in line with the above, with their carer admitted free of charge.